Who fancies whizzing round the city on one of these?! In 2017, the electric scooter boom exploded onto the scene in California. Since then, it’s become the preferred mode of transport for locals and visitors across the country, and is often described as the ideal replacement for cars. Why? Well, they’re eco-friendly, shared, easy to use, quick to park – and a lot of fun to ride. 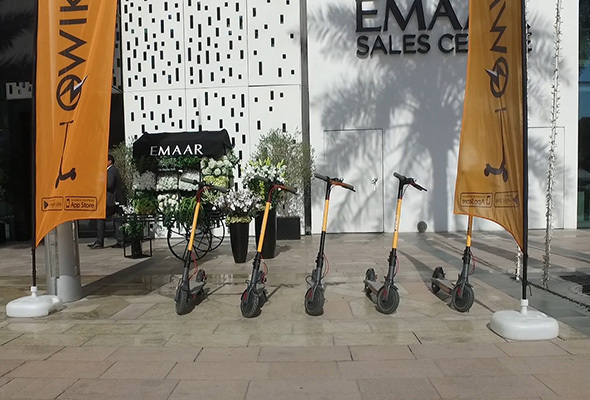 Now, electric scooters have arrived in Dubai thanks to Qwikly Mobility, a Cali tech startup that has chosen to launch its shared electric scooter platform here in the UAE, before branching out across the rest of the MENA region. Update: We’ve been advised that Qwikly have pulled their fleet from Dubai, but are working to be back on the move – or scoot – soon. First you need to download the Qwikly App. The App will show you where the nearest available scooters are. Once you’ve found it, scan the QR code to unlock the scooter. Then stand on it, push the throttle button, and off you go! Ideally use bike lanes where available. Once you’ve finished riding, park your scooter by a bike rack or on wide sidewalks close to the curb. Try leaving at least 1.5m for pedestrians and don’t block any pathways. End your ride by tapping the button with the app. Technically you could ride Qwikly anywhere you want as long as you dock it at the designated locations when you’re done. You’ll be charged an additional fee if you end your ride outside their designated borders. And of course, you’ll just be charged for the time. You’re only really limited to however long the battery lasts, although Quikly’s website says you can only ride scooters from 6am to 9pm. The typical range of a fully-charged scooted is 35Km. Not really, although we’d personally encourage wearing a helmet. The great part about the design of these scooters is that they’re designed to be used in regular clothes, even suits, dresses, abayas and kandoras. To minimise the potential of your toes getting scraped, you probably don’t want to wear sandals or flip flops, although a lot of people will. How much do the scooters cost to rent? It costs Dhs3 to unlock the bike, plus 50 fils per minute thereafter, with additional fees based on the length – in time – of your trip. 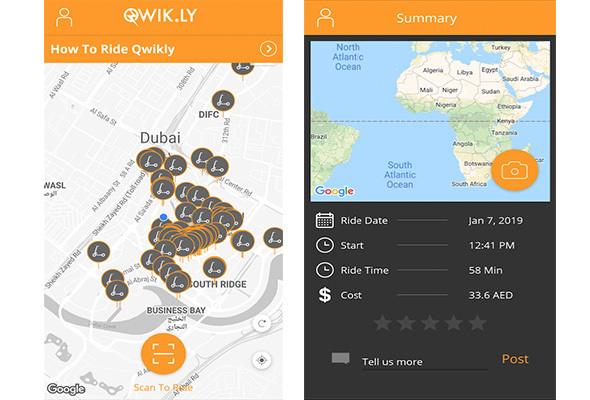 Once you register for the Qwikly app, you’ll need to connect a credit card or debit card to your account, which bills you every time you complete a ride. According to the App, you must have a government issued ID, and be over the 18 years old. You also need to scan your valid driver’s license to operate the scooter. The App will make you scan your license before you ride. You can download the app for free via Qwik.ly.